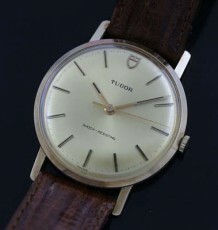 One of the cooler ladies Tudor watches. This Oyster has a very sporty styled case with burgundy dial and rotating bezel. Ladies Sports watches are somewhat uncommon but this ladies Tudor Oyster Chronotime is one of the cooler watches I have listed in the past few years. The solid steel case features a rotating bezel like a submariner only with a burgundy graduated insert instead of black. 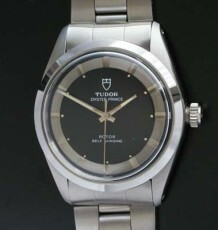 The case was also designed to fit a Tudor integrated Oyster bracelet, like the Tudor Ranger 2. 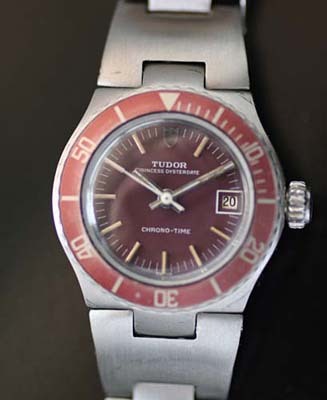 The all original Tudor Oyster Princess signed burgundy dial with date window is in excellent condition. The luminous compound on the dial and hands have a wonderfully warm and matching patina. 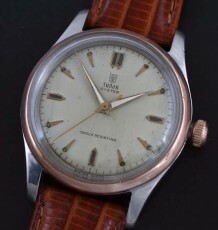 The Tudor signed ETA based calibre 2651 was just serviced by my Rolex trained watchmaker and is keeping excellent time. 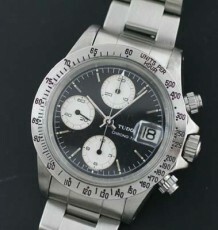 The steel case measures 26 mm wide by 31 mm long.